"A Pathway to the Life You Want"
"TCM, or Traditional Chinese Medicine, is a profound pathway to create the life you truly want to live, the life you were born to live. It’s a timeless bridge that can initiate and support change and growth in any and every life dimension: physical, mental, emotional, and spiritual." "An Ancient yet Completely Modern Healing System"
"TCM has the power to unlock your true potential and help you develop and use your own unique gifts and talents. Its insightful wisdom and ability to understand and address individual health needs empowers each person with a way to unite body, mind, and spirit—the foundation for lasting, authentic health. TCM teaches you how to live a life of balance, wellness, and harmony. TCM can be effectively applied to help heal anyone and any health issue no matter what year it is because it’s rooted in unchanging natural law, which has its source beyond time. This unique paradigm of medicine grew out of penetrating observation of how everything in our reality functions at the deepest, invisible levels and interacts with the surface or visible physical levels. It’s a medicine of extraordinary relationships. Every TCM principle, theory, and healing practice reflects and harmonizes with the relationships that exist within natural law." 1. Your body is an integrated whole. Each and every structure in your body is an integral and necessary part of the whole. Along with your mind, emotions, and spirit, your physical body structures form a miraculously complex, interrelated system that is powered by life force, or energy. 2. You are completely connected to nature. Changes in nature are always reflected in your body. TCM factors in the particular season, geographical location, time of day, as well as your age, genetics, and the condition of your body when looking at your health issues. 3. You were born with a natural self-healing ability. Your body is a microcosm that reflects the macrocosm. Think about it: nature has a regenerative capacity, and so do you. Sometimes, this ability may appear to be lost or difficult to access. In most cases, it is never completely gone. 4. Prevention is the best cure. Do you know your body is continually revealing signs about the state of your health? Let’s face it, it’s common to ignore these signs or symptoms until something more complicated arises. TCM teaches you how to interpret what your body is telling you." 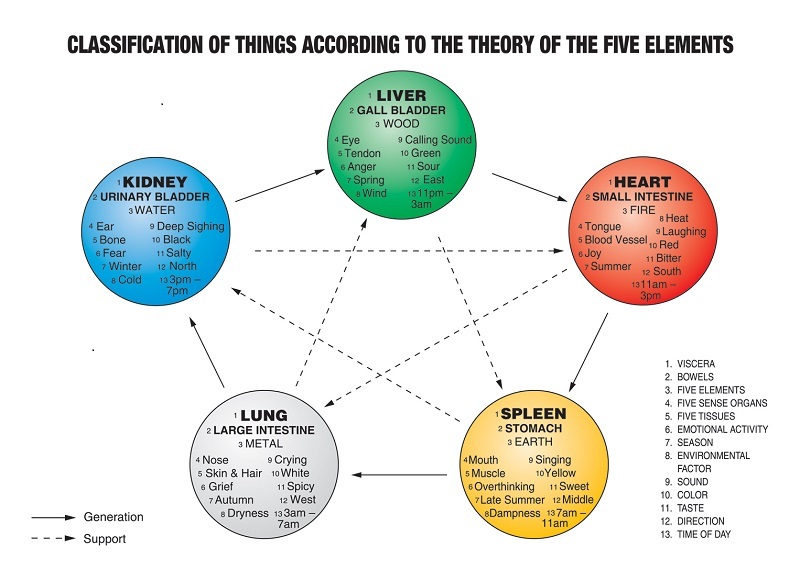 TCM has documented the connections between the Five Major Organs (Liver, Heart, Stomach, Lung, Kidney), Energy or Qi, the Emotions, the Senses, Time of Day & Seasons, Temperature, and Color. This give a TCM practitioner a better understanding of the connections of symptoms to the organ systems. At Bright Path Wellness, Diana's belief that natural solutions are vital for healing of Spirit, Mind and Body compelled her to complete a 4-year Master of Chinese Medicine program, which included Chinese Herbal Medicine and Acupuncture. Herbalism has been a passion of Diana's for over 25 years. High-quality therapeutic-grade Chinese and Western Herbs are an integral part of her toolkit. Individualized prescriptions of Chinese or Western single herb or complex formulas are used to effect an action in the body to correct many conditions. Seasonal allergies, cold & flu symptoms, menopause symptoms, digestive dysfunction, stress, and pain may all be relieved via TCM methods.